Homotopy Groups. 1.1 Function Spaces. 1.2 H-Spaces and CoH-Spaces. 1.3 Homotopy Groups. 2. Fibrations and Cofibrations. 2.1 Pullbacks and Pushouts. 2.2 Fibrations. 2.3 Cofibrations. 2.4 Applications of the Mapping Cylinder. 3. Exact Homotopy Sequences. 3.1 Exact Sequence of a Map: Covariant Case. 3.2 Exact Sequence of a Map: Contravariant Case. 4. Simplicial Complexes. 4.1 Simplicial Complexes. 4.2 Simplicial Approximation Theorem. 4.3 Polyhedra. 4.4 Fibrations and Polyhedra. 5. Relative Homotopy Groups. 5.1 Homotopy Groups of Maps. 5.2 Quasifibrations. 5.3 Some Homotopy Groups of spheres. 6. Homotopy Theory of CW-complexes. 6.1 CW-complexes. 6.2 Homotopy theory of CW-complexes. 6.3 Eilenberg-Mac Lane spaces. 7. Fibrations revisited. 7.1 Sections of fibrations. 7.2 F-fibrations. 7.3 Universal F-fibrations. Appendix: Colimits. Compactly generated spaces. Index. The central idea of the lecture course which gave birth to this book was to define the homotopy groups of a space and then give all the machinery needed to prove in detail that the nth homotopy group of the sphere Sn, for n greater than or equal to 1 is isomorphic to the group of the integers, that the lower homotopy groups of Sn are trivial and that the third homotopy group of S2 is also isomorphic to the group of the integers. All this was achieved by discussing H-spaces and CoH-spaces, fibrations and cofibrations (rather thoroughly), simplicial structures and the homotopy groups of maps. 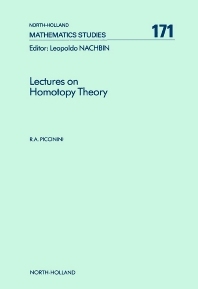 Later, the book was expanded to introduce CW-complexes and their homotopy groups, to construct a special class of CW-complexes (the Eilenberg-Mac Lane spaces) and to include a chapter devoted to the study of the action of the fundamental group on the higher homotopy groups and the study of fibrations in the context of a category in which the fibres are forced to live; the final material of that chapter is a comparison of various kinds of universal fibrations. Completing the book are two appendices on compactly generated spaces and the theory of colimits. The book does not require any prior knowledge of Algebraic Topology and only rudimentary concepts of Category Theory are necessary; however, the student is supposed to be well at ease with the main general theorems of Topology and have a reasonable mathematical maturity.